My Hawaiian ʻohana (family) comes from Hawaiʻi island, some parts specifically from the valley of Waipiʻo, located on the Northeastern part of the island. There are still a few Hawaiian families that live in the valley today, but many left around the turn of the 20th century both due to its remoteness and because of a tsunami that destroyed many homes. You need a 4-wheel drive to even get into the steep valley, so this was as far as we got. I had never been there before, so just getting the chance to see the valley from the overlook was very meaningful to me. Absolutely breathtaking! Note the black sand beach. We also went to Honokaʻa, a town just south of the valley. This is also a place where my family lived for some time. One thing I love about Honokaʻa (and Hawaiʻi island in general) is that there is so much history still present, not yet razed by the urge for constant development. This means that so many of this once-bustling sugar town's buildings erected during its heyday are still there and very much a part of the little town's daily life. My grandpa and his relatives probably went to the movies here at the Honokaʻa People's Theatre. It is still the town's theatre. And did their banking here. This was our last day on Hawaiʻi island, and our last excursion. 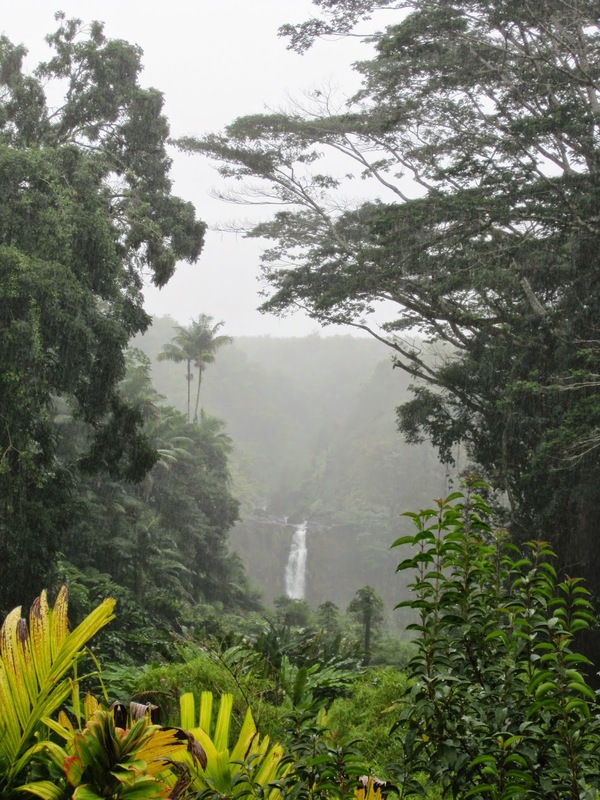 As we headed south back to Hilo, we stopped off at Akaka Falls. Since it was rainy, we didn't do the walk down as the falls was a ways away but this photo gives an idea of just how large the falls really is! And so we bid aloha to Hawaiʻi. That evening we were back on our way to Oʻahu, with many more adventures ahead of us!